CONGRATULATIONS! The DIVNICK™ is the most innovative golf club in 50 years. It combines the latest golf club physics (perimeter weighting, progressive offset shaft alignment, low center of gravity and extra-large sweet spot) with over 34 loft options using a unique vernier transmission hidden in the club. 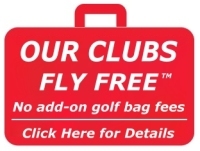 You can select from several putters, all the irons, multiple wedges, and even half lofts. The locking lever needs only to be finger-tight and requires no separate clumsy leverage tool. Simply stated, there has never before been anything like the DIVNICK™! We know you will enjoy it for years to come. To ensure your enjoyment, please review all the directions, warnings, and Best-Play Topics. Quite a few customers have not done this and initially thought their transmission was broken because they didn't understand how to use the back-and-forth shifting, or they didn't know they needed to re-align the black lever. We recommend that you practice adjusting the lofts at home before playing. Then spend a little time at the driving range (off real grass rather than mats if possible). You will learn the distance of each loft and discover which loft gives you the best distance. It may surprise you that it will not be the "D" as discussed in the Best-Play Topics. LEFTIES: These instructions are pictured and described for right handed players. Lefties will be the opposite, except where noted in the loft-adjusting section. TO EXTEND THE SHAFT, hold as shown above and twist and pull until the shaft is loose from the hosel (neck socket), then swiftly pull the ends apart so that the shaft "snap-locks" into its fully-extended position. It will not lock if opened slowly with strength. It must be "snapped" open. If you can twist it loose by rotating the head and grip in opposite directions, it needs to be re-extended...probably with an even snappier motion. Don't worry...you can't hurt the shaft doing this. CAUTION: WHEN COLLAPSING, KEEP YOUR HANDS ON THE GRIP AND HEAD. DO NOT HOLD THE SHAFT BELOW THE HEAD WHICH MAY CAUSE PINCHING WHEN IT COLLAPSES. TO COLLAPSE THE SHAFT, hold the head with your thumb and forefinger as shown with the toe of the club pointing away from you. DO NOT hold it with the toe in the heel of your hand as if it were a cane. Make sure your fingers are NOT touching the shaft as that can pinch them. Also, notice in the picture that I am holding the head at the top of the SHAFT rather than on the main part of the head. This is very important so that the impact force is straight down into the shaft. If you hold the main part of the head, the force is off-line from the shaft and that imparts a sideways impact on the shaft which significantly reduces the necessary impact force. Strike the grip-end of the shaft on smooth hard concrete STRAIGHT DOWN. The harder and smoother the surface, the better. Do not attempt to collapse the shaft on grass, wood, tile, or carpeted floors. Concrete is MUCH harder and better than asphalt. The impact from the concrete transfers directly into the shaft through our proprietary stainless steel collapsing cap which is pressed onto the end of the shaft. A swift "wristy" action is required. Power and muscle does not work, so don't hold the head and grip with a "full hand," grip it lightly with your fingers and thumb as shown. Notice in the picture above that I am bending over a little so that my forearm is more perpendicular to the shaft. This promotes a straight-down motion. Your elbow needs to be at the same level as the head of the club. You don't want to strike the ground at an angle. After the first joint releases, keep your hands on the extreme ends to avoid pinching, and 1) Lift the half-collapsed club about a foot in the air and 2) Strike the grip end onto concrete again until the second joint releases. The second joint is sometimes stubborn and may require several strikes. The "secret" is to make a swift and loose wristy snap straight down. Don't worry about hurting the club. Just make sure you avoid getting your fingers pinched. It's much easier to do this on one knee rather than bending over. Being on a knee promotes a straight-down motion while bending over at the waist tends to cause a sideways impact. Notice that I am still holding the head with thumb and forefinger, with the other fingers away from the shaft. A light grip promotes a wristy action, and you want your fingers safely away from the shaft to avoid pinching. Be sure to watch the video below which includes some other hints. In rare circumstances, the shaft may be difficult to collapse, especially if it is stored in its extended position, which we do not recommend. In almost all cases, difficulty collapsing is because of improper technique…holding the head instead of the top of the shaft, or not snapping it into concrete swiftly enough. However, sometimes it may be necessary to apply heat to the outer section to expand it, then immediately re-striking it onto concrete before the inner section has a chance to get warm. You can heat it with a boiling cup of water, or with a heat gun...the kind used to remove wall paper, or plumber's propane torch. Then immediately try to collapse it on a concrete surface using the above technique. This is the same idea as heating a jar lid to expand and loosen it. The head section locks on the first 3 ring-steps of the middle section, and the middle section locks on the first 2 steps of the grip section. So that is where you would concentrate the heat. Contact us if you have any questions about this. Lefties, see the asterisks* and corresponding explanation at the bottom of this section. To adjust the loft , hold the club head in your left hand with the shaft tucked under your right arm. Be sure to look straight down on the marks as illustrated with the arrow. Do not view from an angle. Unscrew the locking lever (counter clockwise-indicated by white arrow) with your right hand 1 full turn, maybe 1 1/2. This allows the teeth in the transmission to pass each other as they are moved in opposite directions. Rotate the head first one way until it clicks, then the other way until it clicks again. Each PAIR of back-and-forth clicks automatically ADVANCES* the head ½ loft (an almost imperceptible 2 degrees) no matter which way you click first. Ratchet back and forth until the index arrow on the head points to the desired loft, then re-tighten the nut (clockwise). NOTE: When you click it up one direction, it moves 5 lofts (20 degrees). When you click it back, at moves 4 1/2 lofts (18 degrees). That is a half-loft gain. But that is barely noticeable on the small radius with the index marks. 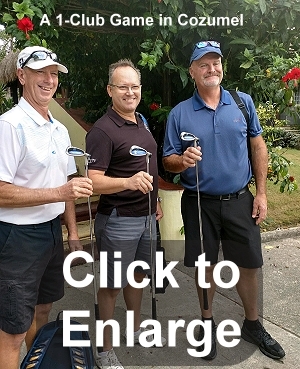 At first glance, without reading the above paragraph carefully, some customers have wondered if their club is broken...thinking the return click is bringing it back to the same position where they started. But it does, in fact, advance with ever pair of clicks. CAUTION: While playing, do not unscrew the lever more than two turns in order to avoid losing parts in the grass. Make sure the lever is tight during storage. SPEED SHIFTING: It is very quick and easy to "speed shift". Just rotate the index arrow on the head so it is on or under* the desired loft mark, and then ratchet in pairs of back-and-forth shifts until it is aligned with the desired loft. When adjusting to the P (Putter) from a steeper loft that you have used to reach the green, rotate the head straight down to the P or under it. Depending on the loft you last used, it might ratchet straight to the P. But more than likely, the arrow will not align with the P without some back-and-forth movements. When you are BELOW* the P, simply advance it in pairs of back-and-forth clicks until the main index arrow is lined up exactly with the P mark. That is the same technique used to adjust for every loft. Move directly to the desired position or below* it...then fine tune the adjustment by ratcheting up* to it in pairs of back-and-forth clicks. The index lines are odd numbered clubs as marked, and the middle of the spaces between the lines are even clubs (2,4,6,8, and pitching wedge). Half-lofts are just above or below the lines as illustrated below. The DIVNICK™ offers the ultimate in fine-tuning your game. Not only does it provide half lofts for those "in between" distances, you have several wedge options including the standard pitching and sand angles on up to super wedges far beyond the last index mark. You will notice that we have two sand wedge marks. The first "S" is a standard 52-degree loft, the second is a 60-degree super wedge with 3 lofts in between. You can even lock it well above the second S mark, at 62, 64, 66, 68, or 70 degrees. If you go much higher, the angle of the blade is so steep that you might take a swing and slide under the ball without moving it...which is actually a pretty cool trick. CLICK HERE to see a full size picture of the head, lofts, and degrees . You can read more about the lofts, transmission, the pros and cons of having half loft options, and much more on our FAQ's. *LEFTIES: The transmission for our left-handed club is exactly the opposite of the right-handed transmission. In other words, it DECREASES 1/2 loft with every pair of clicks. So you would adjust it by speed-clicking directly to the desired loft or just ABOVE it, then ratchet back and forth until it comes DOWN to the desired loft. HOW TIGHT? Tighten the lever "snugly" so that the transmission locks securely. However, it does not require excessive force. Normal tightening is enough to hold for one hit since you usually change lofts for each subsequent hit. Since you are only using finger-tight pressure, repeated hits such as at a practice range will loosen the lever so you should check and retighten it after every 2 or 3 shots while on the range. There isn't enough leverage in that small black lever to torque it tight enough to hold for unlimited shots. See the lubrication recommendations below. TOO TIGHT? If you don't keep it lubricated between rounds as described below, it is possible that it will "lock up" so tightly that you won't be able to easily loosen it for adjusting the loft. In other words, it can require more finger-force to unscrew it than to tighten it. This is caused because of the dry friction between the nut and spring washer. If that happens during play, hold the head in your off-hand (left hand if you are right-handed) with the shaft pointing down toward, but not touching the ground. With your off-hand holding the head, wiggle the club back-and-forth while attempting to unscrew the lever with the thumb on your dominant hand. The angle of the wiggle is important...it needs to be in line with the face of the head, not in line with the threads. The wiggling of the club with the shaft pointing down toward the ground relieves some of the tension between the washer and nut and helps to release it. If that doesn't work for you, you can put a layer of towel between your thumb and the lever to get a little more grip on the lever. Then, before you retighten it again, add some sunscreen, ChapStick, or anything else you can find to get you through the rest of the round. Add it between the nut and washer. Then be sure to lubricate it between rounds as described below. LUBRICATION: You do not need to lubricate (oil) the transmission unless you clean it (next section), but you do need to lubricate the threads and spring washer area between every round. We recommend any light oil or spray lubricant. Unscrew the lever 2 to 3 turns and spray or drip oil into the thread and washer area. HINT: If you forgot to oil it between rounds and you notice the lever being difficult to loosen while playing, you can temporarily lubricate it with sun tan lotion, Vaseline, or even chap stick between the nut and the spring washer. That works great until you can get back home where you can lubricate it with oil. Be very careful if you take the club apart over grass or any place where you can lose the parts. We don't recommend taking it apart unless you are over a table covered with a towel or newspaper. WASHING: Typically, you do not need to wash the transmission. Because the gears pass over each other, it is self-cleaning. Even sand and grit naturally fall out of the transmission. However, if you want to clean it, you can unscrew the locking lever and separate the transmission. Be sure to do this over a towel or table so you don't accidentally drop the parts. Be aware that the spring washer can fly off. Rinse off the parts with soap and water. Let them dry completely. Lubricate all the moving parts with any type of oil or spray lubricant. This is not a high-speed moving part, so any type of lubricant will work fine. IF THE CLUB IS WET from rain or washing, towel-dry it and spray some lubricant on the internal parts including into the loosened shaft joints, and store it in a LOOSENED position so the internal shaft areas can "breath" and dry. SPRING WASHER: This club was originally designed without a spring washer. Since you adjust it by holding the head with one hand and the shaft with the other, by pressing both hands together a little during the back-and-forth ratcheting, it engages the teeth which is all that the spring does. The spring was added later to make it easier for you to make the loft adjustments in the beginning while you are getting used to how it works. But many people remove the spring and use the club like it was originally designed. If you remove your spring, you will need to make a lever adjustment (described below) because you will be removing the thickness of the spring. LEVER REALIGNMENT: The lever is factory-aligned so that when tight, it is approximately parallel to, or slightly in front of the face of the club as shown to the right. It does not necessarily align with the shaft which varies with the loft positions. After you use the club for a while and the transmission and threads break in, the parts fit closer and closer together, and the lever alignment will progress beyond this position. If you don't realign it, it will eventually be pointing down and catching on the grass. You will want to realign the lever as described below and shown in the video clip. Turn the lever so it is aligned with the hosel as shown in picture #1. Insert a screwdriver between the lever and hosel. Keeping the screwdriver blade as close to the nut-end of the lever as possible, twist the screwdriver back and forth to pry the lever about half-way off the nut. With the lever still partly on the nut, screw it back to a tight position as if you are ready to hit the ball. Then pull the lever off the rest of the way by wiggling it back and forth as you pull it off with your fingers. Then push it back on, realigned parallel to the face, or pointing slightly forward of the face for right-handed clubs, or slightly backward of the face for left-handed clubs. Push it back on all the way with your thumb. Do not use a hammer. If you can't push it all the way on with your thumb, place the flat part of the lever against the edge of a table or counter and push the head downward into the lever as shown in picture #2. In most cases, depending on how much you use your club, you will need to realign the lever more than once as the stainless steel teeth and threads "polish" and fit closer and closer together. PARTS AND ASSEMBLY: There are six parts to the head assembly as shown below. The Ring Gear will only fit onto the head with the teeth meshing one way (18 teeth on the head side). The teeth on the other side of the ring gear mesh with the teeth inside the Hosel (20 teeth). Please notice that the spring washer fits with the edges bent "toward" the hosel. The lever is formed like a tight-fitting "socket wrench" to allow it to be adjusted as described above. It simply "presses" tightly onto the nut dry...do not use lubricant. REPLACEMENT PARTS: If you ever need to replace the washer, nut, or lever, please contact us by email or call 1-937-985-5863 (Eastern USA). The head, ring gear, and hosel or cast in a family mold, so are not available separately. HINT: Be very careful if you disassemble the head that you don't lose any of these critical parts. If you want to replace the nut locally, it is a 5/16 x 24 thread grade 8 nut which you can find in most hardware stores. If you keep it lubricated, it will last permanently. LIE ANGLE: You will notice that the toe of the DIVNICK™ is up a little for your full-length shots and the heel is up when putting. This is because of the 64-degree lie angle which is an average of irons and putter. You can read more about this and other performance topics in our FAQ's. DRIVING: The main design-feature of a driver that yields distance is its length which translates into club-head speed. Therefore, it is impossible for the DIVNICK™ to generate as much club-head speed or drive the ball as far as a conventional driver. This is discussed in more detail in the Disadvantages section. But because it's the same length for every swing, many golfers will be able to "groove" their swing and might find that their drives are more consistently down the middle of the fairway with longer average distance. Because the 38.5" DIVNICK™ is the length of a 4 iron, you will get maximum length performance out of the 3 or 4 iron setting, not the driver loft. The "D" position will not hit the ball farther, only lower, and it will be very difficult to hit it solidly and get the ball up because the lower the loft, the smaller the sweet spot. Tee the ball as you would for an iron tee shot on a par 3 hole regardless of the loft selection. Since the 38.5" DIVNICK™ is the length of a conventional 4-iron, when set to lofts above that, it will hit the ball farther than normal. Some people choke down on the grip trying to simulate shorter-length clubs. But you can control the distance better with full swings and adjusting to a steeper loft which will result in a higher trajectory and allow the ball to stop or back up more effectively. PUTTING: The other extreme, in terms of club-length and head shape, is putting. To approximate your normal putting stance, we simply suggest that you "choke down" on the grip, perhaps with your right hand down on the shaft a little. Use the white putting sighting lines in the back of the head for assistance in alignment. TELESCOPIC DRIVER AND PUTTER: The driver and putter are the two extremes of length, head shape, weight, and purpose. If you want to carry those clubs but require portability for travel and convenience, consider our collapsible drivers and putters. Click here for telescopic driver and putter options and pictures. SHAFT LENGTHS: We produce two standard lengths: The 38.5" and the 37" which is recommended for players less than 5'8" tall. We offer half inch custom lengths for an additional $20. After addressing the ball and taking a few swings, if you wish you had a different length, you may send your shaft back to us and ask for the other length. This offer presumes that the shaft and hosel socket is not scratched or otherwise unfit for resale. You can read more about lengths in our FAQ's. "Thank you for making the clubs for me and my friends so quickly. Here's a picture of us golfing in Cozumel. It's Captain Shawn, my buddy Geritol, and myself. These adjustable clubs are fantastic! The first time I used it included a little practice on the driving range, then 18 holes. I shot 78 with it! Since the 4-iron length Divnick's don't hit the ball as far as a longer-shafted driver, we play from the forward tees so we can still reach the greens in regulation. It makes the game fun and I encourage everyone to play it forward! People at the course couldn't believe it. The pro and starter both hit it, took pics of it and loved it. I am positive you will be getting calls and orders from this." NOTE FROM STEVE DIVNICK: We really like the idea of "Playing it Forward". We all know that this 4-iron length can't generate as much clubhead speed as a driver, so why not shorten the course by playing the forward tees and give yourself chances to reach the greens in regulation. Your absolute satisfaction is guaranteed. You may return your DIVNICK™ for any reason at any time. The DIVNICK™ also carries a lifetime warrantee against breakage. If it ever breaks, we'll fix it. No charge. Click here for details.